Friedman Fine Art features a magnificent array of historical and contemporary photographs of Chicago. Designed by architect firms Perkins & Will and Edward Stone, the Aon Center was constructed in 1974 and remains the third tallest building in Chicago. Standing 1,136 feet high with 83 stories, it has 2.3 million square feet of floor space, shared by Aon’s US operations and Jones Lang LaSalle operations. The Aon Center is similarly designed to First Canadian Place in Toronto, Canada, but its windows take on a different look. The Aon Center is also the tallest building in the world without any major antennae or finials at the top. The Aon Center has V-shaped perimeter columns, resistant to earthquakes and wind gusts. The structure reduces sway and prevents column bending. This structure was also used for the World Trade Center towers in New York City. Composed of marble and steel, it earned the nickname “Big Stan” when it was completed as the tallest building in Chicago. A year later, the Sears Tower became Chicago’s tallest building. It was first known as the Standard Oil Building and then renamed the Amoco Building. 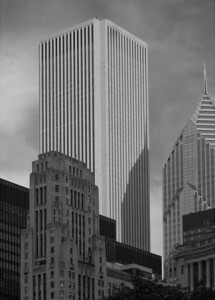 In 1998, Amoco sold the building to The Blackstone Group and became the Aon Center in 1999, although the Aon Corporation moved in a few years later. Just off Michigan Avenue in Chicago’s South Loop, it is located shopping and dining. Inside, it offers spectacular city views of the city. Currently, the city lights the top floors at night with colors for a particular season or holiday. Learn more about our Chicago photographs in greater detail.